Nintendo: A thing of my past? Growing up, Nintendo was king in our household. The SNES our first system, it reigned supreme for quite some time. Eventually we got our hands on an NES and even a Genesis for a bit, but rather fond memories are still with the SNES. At one point in my youth, my brother, sister and I decided to pool money together (it took a lot of saving) and sell our SNES and NES (the Genesis was already gone) in order to afford an N64. Looking back today, I think it silly of us to sell those two awesome systems... but back then, being kids with little to no income, we did what we had to. The N64 blew my mind when I first got to see Zelda in 3D! Many an awesome game later and it came time for the new generation of gaming and... the PS2 was my choice over the gamecube/xbox. 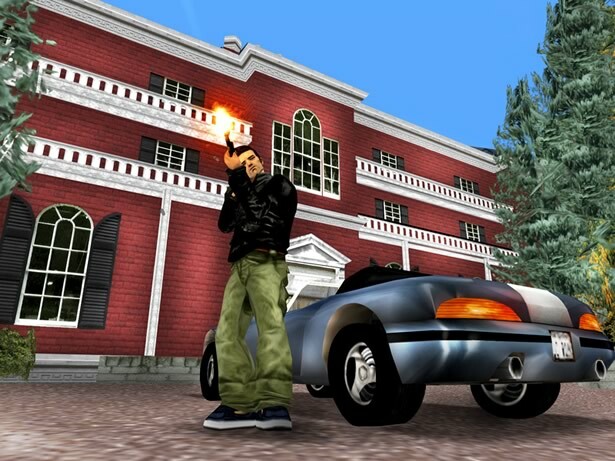 GTA3 is really what did it for me, at the time I had never seen another game like that. Time went on and I loved my PS2 and my sis got her hands on a Gamecube of which I was able to experience what I wanted on the system (namely Zelda). FF>> a number of years and I even snag one myself from ebay for cheaps to replay some Zelda goodness. GTA3 - showed me a world outside of Nintendo... and I liked it. Since the Gamecube though... Nintendo has never been the same in my eyes. Those mammoth hit games didn't seem to be on the gamecube and for the exception of a handful of titles, I really wasn't that put out not owing the system during it's generation. Along comes the Wii and same thing really. I did end up buying a Wii (again cheap) mostly (again) for Zelda... (which is my weakpoint eh?) and for it's kewl virtual console feature. However, my Wii gets the least amount of use out of all my gaming systems, right behind my DS and I'm left scratching my head as to why. Quite honestly... I'm not even sure why I purchased a DS... (maybe Zelda? of which I own both)... my experience with it has been quite "meh" to be honest. 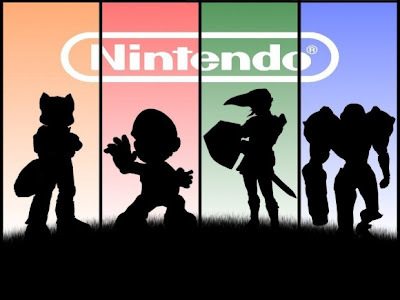 A few titles I've enjoyed like the Zelda titles, the Kingdom Hearts game, Scribblenauts, the Pokemon gold remake and no doubt a few more... but now that Nintendo has a new handheld out... and the games have shifted to that... I've come to a realization that I really don't care for my DS. Jump back to home consoles... and the Wii - with a software lineup coming to a close with the Wii U announced... sits on top of my 360, waiting for me to turn it on. Again, Zelda rawks - but thus far a Wii-mote version of Twilight Princess is all we have for it. The Metroid Prime trilogy really made me smile, as it's a blast of a series (again even though 2/3s of it is gamecube games), Mario is usually goto for a romp and the New SMB along with 2 Galaxy titles were decent and I've had fun with Donkey Kong and Monster Hunter (even if Monster hunter is better on the PSP) but... my "awesome" experiences with it seem to extend solely from Virtual Console games... which is sad. Three titles I've been looking forward to (and also happen to be what prompted this rant) for the system have just been thrown into limbo. The Last Story, Xenoblade: Chronicles and Pandora's Tower are now all under the status line of "there are no plans to bring these three games to the Americas". Yep... the 3 titles that I thought would be the biggest bang for me on the system I feel has done a poor job of entertaining me... might never see the light of day. I think it hilarious that Nintendo keeps touting their love for the core gamer and how they're aiming to get that crowd back and yet... they pull stuff like this. Awesome guys! You know, just cut off three wonderful looking titles that bring a hint of core gaming to your system and keep pumping out mini-game collections and over priced remakes. Woo. 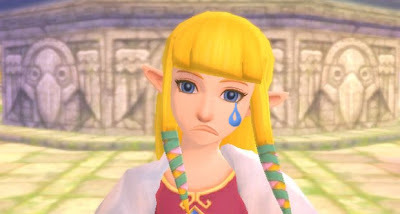 Zelda is sad... and so am I.
Oh hey, I almost forgot. Did you hear!? In the new Zelda title, both Link and Zelda are in boarding school! Woo! Yeah! *Rolls eyes. "The Wii U supports just one touch-screen controller per console, Nintendo's Shigeru Miyamoto has confirmed. 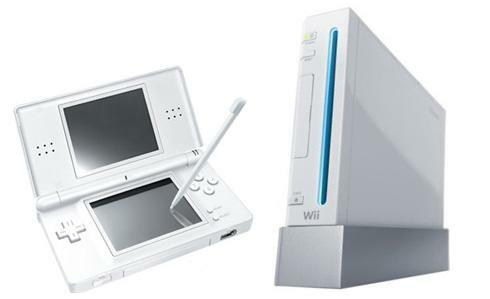 But if a game should require more, a 3DS could theoretically be used instead. (link)"
Not to mention that everything they were showing at E3 on the device was either conceptional (faked) or not even footage run from an actual Wii U machine. Why in the hell would you show off and sell a system that's literally all about it's new "innovative controller" and then say "Oh, btw you can't have friends use one too, it's just one per console" and then expect anyone who wants to play multiplayer to pony up $300 for a 3DS.... ACK!!! That literally makes me want to walk down to Nintendo HQ and kick each and every one of their higher ups in the face. It frustrates me so, because I like what I've seen from the Wii U thus far... and yet there's these big ol stakes in the road that Nintendo keep tossing our way and assuming it won't matter. If Nintendo doesn't do something other than talk lies and not deliver, I may of just had my fill with them. Even if that means no more Zelda. Time to finish up some titles!